The woven cable stitch pattern looks amazing to me. I am always amazed at what you can create when you knit and this pattern is definitely an eye-popper. It really stands out and actually looks like a real basketweave pattern or lattice work the way the stitches all work in together. Even though the woven cable may be a bit more challenging to knit give it a try anyway and see how you like it. You just might surprise yourself. Pull out some scrap yarn and away you go. 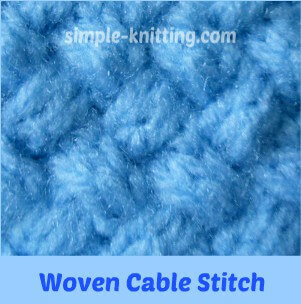 The woven cable stitch creates a tight, dense fabric so you may want to try using bigger needles. And because it is quite a tight fabric it doesn't have a lot of drape. You'll have to see how it turns out on bigger needles. Your stitches will also be tight because of the stitch pattern so don't be afraid that you're doing it wrong. You see there are no purl stitches in between the cables and there is no extra space either so that's why it works up pretty tight. Before you start you may like to refresh your memory on how to knit cables just so that you're all ready to go. C4F (cable 4 front): Slip next 2 stitches to a cable needle and put in front of work, k 2 from left needle, k 2 from cn. C4B (cable 4 back): Slip next 2 stitches to a cable needle and put in the back of work, k 2 from left needle, k 2 from cn. If you'd like to knit a sample cast on 8, 12, 16 or 20 stitches. Row 1 (Right Side - cable row): *C4F; rep from * to end. Row 3 (cable row): K2, *C4B; rep from * to last 2 sts, k2. And that's all there is to it. It's a gorgeous cable stitch pattern and I know it's more of a challenge to work but what an awesome feeling to make it. I found a lovely woven cable scarf pattern you can try.